People seem to like disaster movies, particularly ones that leave New York City completely desolate. In these films, the city's infrastructure is intact, but bereft of human activity, it is defenseless as nature creeps back in. These movies play on the idea that urbanism and nature are mutually exclusive. As Eric Sanderson writes in one of my favorite passages of Mannahatta, "It a conceit of New York City—the concrete city, the steel metropolis, Batman's Gotham—to think it is a place outside of nature, a place where humanity has completely triumphed over the forces of the natural world, where a person can do and be anything without limit or consequence." The people are what make this city great. This has been a frenetic, but exciting New York week for me. With Halloween, the marathon, the mayoral election and the Yankees' ticker-tape parade, I spent most of the last week overwhelmed by masses of people, their excitement and frustration crushingly palpable. At each of these events, I felt pride and enjoyment (yes, even at the ticker-tape parade, thanks to Jay-Z), but I also found myself searching for a quiet moment, a place to breathe, my own personal empty Times Square with meadow grass sprouting through the asphalt. And this is why I think we like these disaster movies: because New York is as stressful as it is uplifting. Though we love our skyscrapers, sports events and over-the-top celebrations, there is a part of us that wishes for a quieter and more profound experience, which we see distilled by an idealized natural world. 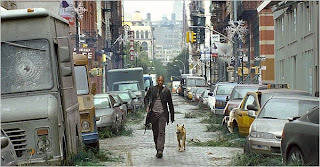 Image from I Am Legend. Hilarious, Jess. I'm telling you, you'd love Brooklyn.